That's just showing most played in absolute terms, which while showing some clear regional patterns makes it hard to discern state-by-state differences in music taste. 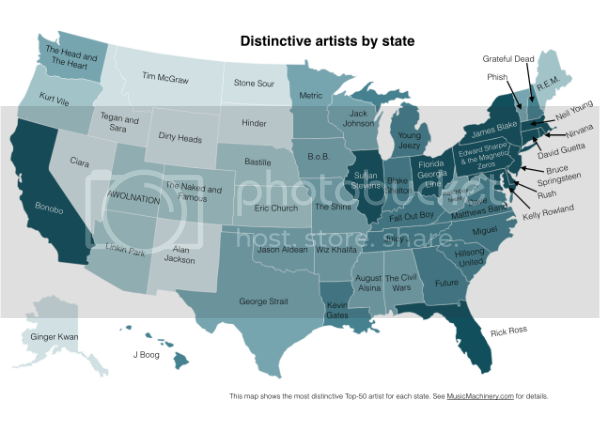 What's perhaps more interesting, the second map (below) shows artists in each state that, according to this study, have the greatest positive deviation from the mean (i.e. the rest of the United States). The study was conducted by Paul Lamere of Echo Nest, a company that specializes in music intelligence. To see how where you live affects what you listen to, go play with their new app here.